Bred, Owned and Trained by John and Laura McCarthy. Smakwater and Sprezzatura Kennels, owned and operated by John and Laura McCarthy, is located in the Bitterroot Valley near Stevensville Montana, just 3 miles north east of the Lee Metcalf National Wildlife Refuge. The name Smakwater and Sprezzatura refers to the line of Labrador Retrievers we breed, train, and handle. 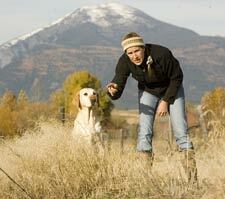 Our retrievers are also known as The Last Best Labradors. Smakwater and Sprezzatura’s objective is to maintain a line of Labrador Retriever that is consistent with the breed standard as originally prescribed by the American Kennel Club, and to provide ethical consideration in the handling and care for the animals we breed, train, and board. We have been blessed with Labrador Retrievers for over 30 years, and we are experienced in setting up tests and evaluating the attributes of the Labrador Retriever in accordance with the American Kennel Club standards in the field, the conformation ring, and obedience ring. We have served at AKC events as judges, secretary, committee member, steward, marshal, gunner…, and so have committed to uncompromised ethics and sportsman like conduct. 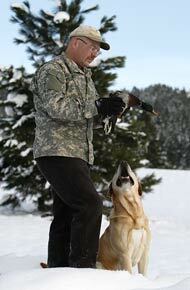 We train our own dogs, hunt with them, and handle them at events. Our Labradors have earned titles and awards in the conformation ring, the obedience ring, at field events, and have certified for canine therapy work. We have participated in activities since 1992 with organizations that include The North American Hunting Retriever Association “NAHRA”, American Kennel Club “AKC”, United Kennel Club “UKC, International All-Breed Canine Association “IABCA”, and the Delta Society. We have been privileged volunteers for the United States Fish Wildlife and Parks “USFWP” under the Montana State Fish and Game, National Wildlife Refuge System “NWR” specifically The Lee Metcalf National Wildlife Refuge, Teller Wildlife Refuge, Ducks Unlimited, Green Wings, and with a number of schools, both public and private which provide educational programs related to dogs, dog bite awareness, obedience training and retriever training for the purpose of waterfowl conservation and wetland stewardship. In addition, we have been members of many breed and event clubs including The Five Valley Kennel Club “5VC”, Treasure State Retriever Club “TSRC”, Missouri Head Waters Gun Dog Club “MHGDC”, and The Western Montana Retriever Club “WMRC” of which we served as board members. Our involvement with various organizations has afforded us much satisfaction, however, our true love is for the Labrador breed itself, and especially the individual dogs whose relationships have so enriched our lives. We like to think of ourselves as having a traditional perspective unique by ethics and style, and of our dogs as truly being the Last Best Labradors Born of the Water and of the Spirit! We chose the kennel name Smakwater and Sprezzatura to symbolize our perspective of the Labrador Retriever. Smakwater spelled without the c symbolizes uniqueness and the term represents the Labrador’s stylish entry when retrieving in water. Sprezzatura is an Italian renaissance word defined by “the Ability to Make the Difficult Look Easy”.